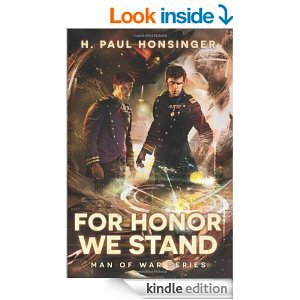 “For Honor We Stand” (Man of War Book 2) by H. Paul Honsinger. 510 pages. “In 2315, the Earth Union is losing a thirty-year-long war with the Krag Hegemony. Having encountered the Krag before, Space Commander Max Robicheaux now faces daunting challenges aboard the USS Cumberland: the dangers from the enemy without…and clashes with crew and superiors within. Meanwhile, Doctor Sahin receives a coded message summoning him to a secret meeting that aims to forge an alliance that could change the balance of power in Known Space. But first, he must circumvent the fighter ships and heavily armed troops of the traitorous emir bent on killing him before he reaches the negotiating table. Both men must call upon their developing skills and growing friendship to bear the burden of carrying between the Krag Hegemony and the Earth Union a fateful ultimatum and the shocking answer—an answer that could spell eternal slavery, or even extinction, for all humankind. There are wonderful battle scenes throughout, and what’s great about them is the author doesn’t get bogged down with the usual cliches of hand-to-hand fighting that precludes a lot of military science fiction. Instead, battles of the future, as they are now, are often fought at great distances using strategy and guile that makes it less like a boxing match and more like a chess match. In addition, much of the book is taken up with the mundane necessities of being the skipper of a destroyer-class naval vessel in the future. There are dangers that happen even when one is not in battle, and those are included too. What makes this book fun and interesting is the same thing that makes most books interesting: you end up caring about the characters. Characterization is one of the major strengths of this series. I have two negatives about the book, however; one of them that is a repeat from the first book. First, I felt that the new captain, a lieutenant commander still in his 20s, had very little difficulty or self doubt when assuming his new responsibility as skipper. I would think that someone who is assuming a high-stress position like this would make a few missteps and need to counsel with someone. But that’s not the personality of Max Robichaux. Second, and this was something I felt just for this book, the story consisted of many incidents that were tied to each other only because they all happened on the same ship. I really was looking for a story that would be tied together with a story arc a bit better. The last third of the book has a bit story arc, but as a whole the story was almost written as episodes rather than trying to get from point A in the beginning of the book to point Z at the end of the book. It was just a little annoying to me. This book ends on a cliffhanger, and the end of the book announced that the third book in the trilogy would be out in April, 2014. Apparently that hasn’t happened yet. But I would rather the author focus on accuracy and detail (he even includes a glossary at the end of each book!) and come out late, rather than rush it to publication before it’s ready. I give this book 3 1/2 stars out of 5. The Dog Days of Summer. The Guns of August. Or Some Such Nonsense.